What if everything you thought you knew turned out to be a lie? After a layoff and months of struggling, Alice Humphrey finally lands her dream job managing a new art gallery in Manhattan’s trendy Meatpacking District. According to Drew Campbell, the well-suited corporate representative who hires her, the gallery is a passion project for its anonymous, wealthy, and eccentric owner. Drew assures Alice that the owner will be hands off, allowing her to run the gallery on her own. Her friends think it sounds too good to be true, but Alice sees a perfect opportunity to make a name for herself beyond the shadow of her famous father, an award-winning and controversial film maker. Everything is perfect until the morning Alice arrives at work to find the gallery gone—the space stripped bare as if it had never existed—and Drew Campbell’s dead body on the floor. Overnight, Alice’s dream job has vanished, and she finds herself at the center of police attention with nothing to prove her innocence. The phone number Drew gave her links back to a disposable phone. The artist whose work she displayed doesn’t seem to exist. And the dead man she claims is Drew has been identified as someone else. When police discover ties between the gallery and a missing girl, Alice knows she’s been set up. Now she has to prove it—a dangerous search for answers that will entangle her in a dark, high-tech criminal conspiracy and force her to unearth long-hidden secrets involving her own family… secrets that could cost Alice her life. This was my first experience reading Alafair Burke’s work and man, she didn’t disappoint! Her previous novels were series, so Long Gone is her first stand-alone mystery. If you’re already a fan of hers, then you already know to expect great things here. If you’re like me and have never read an Alafair Burke novel before, then you’re in for a treat! Burke takes the time to set up the story and doesn’t assume you’ll fill in the blanks. I love it when an author describes the details of the city so well that I feel like I know my way around. Alafair Burke lives in New York and uses her insider knowledge to paint a vivid picture for you. She gives us fully developed characters like Alice, who is smart, resourceful, relatable and likable- someone you might choose as your friend. Alice’s family is dysfunctional (and really, whose isn’t? ), but it works for them. Throw in the long-time family attorney who’s like an uncle, a missing girl, a murder, an addict brother and suspicious friends and you have all the makings of a grand mystery. In Long Gone, Alice discovers too late that the pictures we post on social-networking sites can be manipulated and re-purposed to look like something they’re not. With all the press recently about one social-networking site’s facial recognition software to help friends “tag” each other, this couldn’t be a more timely lesson. And scary when you really stop to think about it. 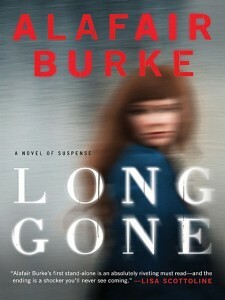 If you like suspenseful crime novels, you will absolutely love Long Gone. There are enough twists and turns to keep you guessing, with just enough clues sprinkled in to make you think you know what’s going to happen next- but you’d be so wrong. Long Gone is a perfect Summer escape, and I gave it 4 Sunshines!